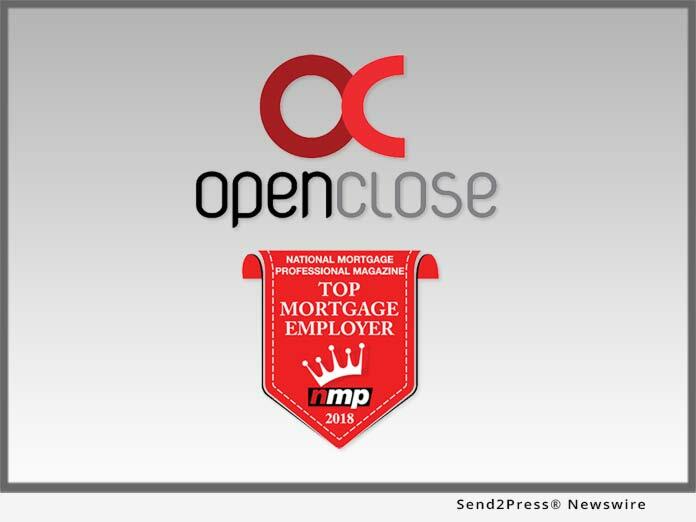 WEST PALM BEACH, Fla., March 9, 2018 – OpenClose®, an industry-leading multi-channel loan origination system (LOS) and mortgage fintech provider, announced that was again honored as a Top Mortgage Employer by National Mortgage Professional magazine (NMP) for 2018. OpenClose was one of only ten companies to be included in the Services Providers category. OpenClose is known to hire employees that have rich backgrounds in the mortgage industry and possess both mortgage technology and also mortgage lending experience working for vendors as well as lenders. OpenClose’s multi-channel LenderAssist™ LOS platform and robust OC Correspondent™ module has fueled record company growth the past few years, which resulted in the addition of new employees in nearly all functional areas within the company. OpenClose is headquartered in West Palm Beach, Florida and also has an office in Gig Harbor, Washington.